More than 100 million adults in the United States have been diagnosed with diabetes or prediabetes. There are also more than 7 million adults who have diabetes but don’t know it. And the disease doesn’t affect just adults. Almost 200,000 children and teens also have diabetes. Having diabetes increases your risk of contracting infections and it slows down the healing process. 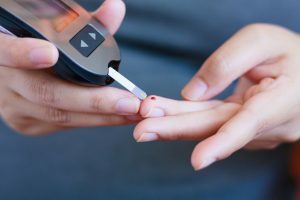 A study from the United Kingdom published earlier this year found that people with diabetes had a higher risk of contracting serious infections. The researchers found that over 6% of adults aged 40 to 89 years who had been hospitalized for infections also had diabetes. This number rose to 9% when looking at people aged 50 to 69 years. Over 12% of deaths caused by severe infections (sepsis) were related to diabetes. The most common were skin infections (cellulitis) and pneumonia. Rarer but more serious infections included those in the bones, joints, and heart (endocarditis). Why does diabetes increase risk of infection? The increased amount of glucose (sugar) in the blood decreases your immune system’s ability to fight off infections. Your circulatory (vascular) system becomes less efficient over time, so the blood cannot deliver the vital oxygen and nutrients to keep your body’s tissue healthy. People with diabetes can develop peripheral neuropathy, a condition that makes it easier for wounds to occur to the feet. These wounds may not be noticed at first, and can worsen and become infected before they are treated. National Diabetes Month is dedicated to raising understanding of diabetes overall, but this year’s theme is on gestational diabetes, diabetes that occurs during pregnancy. Researchers don’t have exact numbers about how many pregnant women develop gestational diabetes, but studies show the number could be as high as 9%. Women who are pregnant already have additional risk factors related to infections. They can occur following a miscarriage, abortion, or Cesarean section, for example. Women who have prolonged labor or whose membranes ruptured for a long period before giving birth are also at risk. Following delivery, mastitis (infection in the breast) is also a possibility. So, if diabetes is also part of the picture, the risk of infection increases, along with sepsis. For this reason, pregnant women who have diabetes must take extra care to reduce their risk of contracting infections and to seek medical help if they suspect they have one. Gestational diabetes goes away after the baby is born for most women, however having gestational diabetes does increase your risk of developing type 2 diabetes later on in life. The key to better health with diabetes lies in identifying it early and good medical control. So if you have had gestational diabetes, the National Institute of Diabetes and Digestive and Kidney Diseases suggests that you be tested for type 2 diabetes three months after giving birth and then every three years thereafter if the test is negative (you don’t have diabetes). Diabetes is a long-term, chronic disease. By taking proper care of yourself, you can reduce the risks of complications like infections and sepsis. If you have any concerns about your health, speak with your doctor or your diabetes care team about how you can take the best care of yourself. Please visit our Sepsis and… library for more information on sepsis and diabetes, and sepsis and pregnancy & childbirth, as well as other conditions mentioned in this article.